Objective To validate the targeted next-generation sequencing (NGS) platform-Ion Torrent PGM for KRAS exon 2 and expanded RAS mutations detection in formalin-fixed paraffin-embedded (FFPE) colorectal cancer (CRC) specimens, with comparison of Sanger sequencing and ARMS-Scorpion real-time PCR. Participants 51 archived FFPE CRC samples (36 men, 15 women) were retrospectively randomly selected and then checked by an experienced pathologist for sequencing based on histological confirmation of CRC and availability of sufficient tissue. Methods RAS mutations were detected in the 51 FFPE CRC samples by PGM analysis, Sanger sequencing and the Therascreen KRAS assay, respectively. Agreement among the 3 methods was assessed. Assay sensitivity was further determined by sequencing serially diluted DNA from FFPE cell lines with known mutation statuses. Results 13 of 51 (25.5%) cases had a mutation in KRAS exon 2, as determined by PGM analysis. PGM analysis showed 100% (51/51) concordance with Sanger sequencing (κ=1.000, 95% CI 1 to 1) and 98.04% (50/51) agreement with the Therascreen assay (κ=0.947, 95% CI 0.844 to 1) for detecting KRAS exon 2 mutations, respectively. The only discrepant case harboured a KRAS exon 2 mutation (c.37G>T) that was not covered by the Therascreen kit. The dilution series experiment results showed that PGM was able to detect KRAS mutations at a frequency of as low as 1%. Importantly, RAS mutations other than KRAS exon 2 mutations were also detected in 10 samples by PGM. Furthermore, mutations in other CRC-related genes could be simultaneously detected in a single test by PGM. Conclusions The targeted NGS platform is specific and sensitive for KRAS exon 2 mutation detection and is appropriate for use in routine clinical testing. Moreover, it is sample saving and cost-efficient and time-efficient, and has great potential for clinical application to expand testing to include mutations in RAS and other CRC-related genes. This is the first study to evaluate the targeted next-generation sequencing (NGS) platform-Ion Torrent PGM and Ion AmpliSeq Cancer Hotspot Panel for expanded RAS mutation testing in formalin-fixed paraffin-embedded (FFPE) colorectal cancer (CRC) specimens. Our results highlight the strengths of the targeted NGS platform-Ion Torrent PGM for KRAS exon 2 and expanded RAS mutation detection in FFPE CRC specimens, with comparison of Sanger sequencing and ARMS-Scorpion real-time PCR. The study is limited by the relatively small sample size. We are approaching an era of personalised and precision medicine where cancer diagnosis and treatment will be tailored to each individual patient depending on their unique genetic signatures. Epidermal growth factor receptor (EGFR) plays important roles in the growth and survival of many solid cancers, including colorectal cancer (CRC).1 Anti-EGFR therapies have been proven to be effective in a subset of patients with metastatic CRC. Given that only a small subgroup of patients with metastatic colon cancer respond to cetuximab, prediction of patient responses to anti-EGFR therapies is necessary to avoid side effects and to save costs.2 RAS proteins (HRAS, KRAS and NRAS) are important downstream effectors that transmit signals from cell surface receptors, including EGFR, to intracellular signalling cascades by cycling from an inactive GDP-bound form to an active GTP-bound form. The KRAS gene, a member of the RAS family, is mutated in approximately 35–45% of CRC, and mutations in codons 12 and 13 of exon 2 of the KRAS gene render the GTPase insensitive to GAP stimulation, leading to the constitutive activation of this protein in the GTP-bound form.3 It is well known that patients with KRAS-mutant CRC are resistant to treatment with anti-EGFR agents (cetuximab/panitumumab) because the KRAS activating mutation occurs downstream of EGFR. KRAS has been confirmed as a predictive biomarker for the efficacy of anti-EGFR therapy in CRC.3 For this reason, KRAS mutation testing is being increasingly recommended for the selection of patients with CRC to receive anti-EGFR therapy.4 ,5 Testing for KRAS exon 2 mutations has been added to the National Comprehensive Cancer Network (NCCN) clinical practice guidelines for colon cancer since 2008. Moreover, extending KRAS exon 2 testing to include RAS has been recommended in the latest NCCN colon cancer guidelines (V.2.2015). A number of sequencing and PCR-based techniques are currently available for KRAS mutation testing in clinical practice, and each has specific advantages and limitations.2 ,6 ,7 Traditional Sanger sequencing has been considered the gold standard for identifying mutations for many years due to its low false-positive rate and high specificity. However, this method is limited by its low sensitivity, and it is also time consuming due to the need to manually analyse sequencing chromatograms to search for mutations. The Therascreen KRAS Mutation Kit (Qiagen, Hilden, Germany) has been developed for performing a real-time, allele-specific assay (PCR) using Scorpion ARMS technology to detect the most common KRAS mutations in codons 12 and 13. It has greater sensitivity for detecting low-level mutations compared with that of Sanger sequencing, and it has been Food and Drug Administration (FDA) approved for KRAS mutation detection using DNA extracted from formalin-fixed paraffin-embedded (FFPE) colorectal adenocarcinoma tissue.8 However, the Therascreen assay was designed to only detect specific somatic mutations in exon 2 of the KRAS oncogene.9 Moreover, the traditional methods are especially costly and time consuming for expanded RAS mutation or multiplex genetic testing. In recent years, rapid technological advances have broadened next-generation sequencing (NGS) applications from research to clinical testing.10 NGS provides a cost-effective, high-sensitivity and high-throughput platform for examining genetic aberrations in the clinical setting.11 As we know, the recently updated NCCN guideline strongly recommends genotyping of tumour tissue (either primary tumour or metastasis) in all patients with metastatic CRC for RAS (KRAS exon 2 and non-exon 2, and NRAS), and patients with any known KRAS or NRAS mutation should not be treated with cetuximab or panitumumab. Given the sample-inefficiency, cost-inefficiency and time-inefficiency of traditional methods, the NGS platform has great potential for clinical application in performing such multiplex genetic testing in FFPE CRC specimens. Currently, several NGS platforms are commercially available for the sequencing of either targeted genomic regions or whole genomes/exomes to analyse a variety of disease-associated genetic alterations, such as point mutations, insertions, deletions and copy number variations.12 However, routine application of NGS in clinical oncology is still in its infancy.11 Ion Torrent PGM is a promising NGS platform for targeted gene panel sequencing; it has demonstrated high productivity and performance, and shows clinical promise, especially for detecting single nucleotide variants (SNVs).13–15 Although there are several other studies comparing NGS platforms and other methods, the potential clinical application of Ion Torrent PGM for determining RAS mutation status in FFPE CRC samples has not yet been well investigated, which is especially meaningful based on the latest NCCN CRC guidelines. Therefore, in this study, we aimed to analyse its performance for detection of KRAS exon 2 mutations in terms of sensitivity and specificity compared with two other methods that are currently used in clinical practice, bidirectional Sanger sequencing and the Therascreen KRAS assay, and to explore its potential clinical use for extended RAS mutation testing. Prev denotes the prevalence of disease in the population. The prevalence of disease in the population was 40% in our present study, and thus the overall sample sizes calculated based on sensitivity and specificity were 38.0 and 50.2, respectively. The maximum total number of participants based on sensitivity and specificity was 50.2, and thus a sample size of 51 was finally selected in our study. A total of 51 archived FFPE CRC patients’ samples (including 43 primary and 8 metastatic lesions) were retrospectively retrieved from surgical pathology files at the Peking Union Medical College Hospital from January 2014 to March 2015. Simple random sampling, based on random numbers generated by Microsoft Excel, was used to select the cases to avoid sample selection bias. These samples (36 surgical specimens and 15 biopsy specimens) were checked for sequencing by an experienced pathologist, based on histological confirmation of colorectal adenocarcinoma and availability of sufficient FFPE tumour tissue for performing the three methods. Patient's informed consent was obtained. Pancreatic cell lines (Panc-1 and BxPC-3) were obtained from the ATCC. They were fixed and embedded using the same methods employed for the tissue samples. An appropriate paraffin block containing tumour tissue was selected for analysis by an experienced pathologist, who reviewed H&E-stained slides. The tumour area on the H&E-stained slide was marked and then manually macrodissected from up to 10 unstained sections (5 mm in thickness) to enrich for tumour cells before DNA extraction. Tumour cell content ranged from 60% to 95%, with a median cellularity of 80%. DNA was isolated using a QIAamp DNA Mini Kit (Qiagen). The same DNA extraction method was used for the FFPE cell lines. The extracted DNA was then quantified using a Qubit dsDNA BR assay (Life Technologies, Gaithersburg, USA). In total, 10 ng of DNA were used as template to generate an amplicon library for sequencing. Libraries were prepared using an Ion AmpliSeq Library Kit 2.0 and an Ion AmpliSeq Cancer Hotspot Panel v2 (Life Technologies), which amplifies 207 amplicons covering approximately 2800 COSMIC mutations in 50 oncogenes and tumour suppressor genes, with wide coverage of RAS (KRAS, NRAS and HRAS) and other CRC-related genes (BRAF, TP53, APC, MLH1, PIK3CA, SMAD4, FBWX7, etc). Adapter ligation, nick repair and PCR amplification were performed according to the manufacturer's protocol. The libraries were then quantified using a Qubit dsDNA HS Assay Kit and a Qubit 2.0 fluorometer (Life Technologies). Next, they were each diluted to a concentration of 3 ng/mL and pooled in equal volumes. Emulsion PCR and enrichment steps were carried out using an Ion OneTouch Template Kit and an Ion OneTouch system (Life Technologies), according to the manufacturer's protocol. Following enrichment, the amplicon libraries were sequenced with an Ion Torrent PGM system (Life Technologies), using a 314 Chip, with barcoding performed using an Ion Xpress Barcode Adapter 1–16 Kit (Life Technologies). After sequencing, the readings were mapped to the reference genome (hg19) using the Torrent Mapping Alignment Program (TMAP). A cut-off of 300 000 AQ20 readings was used as a measure of successful sequencing on the 314 Chip. Variants were identified using Torrent Variant Caller (3.6.6; Life Technologies). A sequencing coverage of 200X was used as the minimum requirement to verify the authenticity of sequence variants. Integrative Genomics Viewer (Broad Institute, Massachusetts, USA) was used to visualise variants aligned against the reference genome to confirm the accuracy of the variant calls by checking for possible strand biases and sequencing errors. A Therascreen KRAS Mutation Kit (Qiagen) was used according to the manufacturer's instructions. This assay is designed to detect a wild-type control and the seven most common KRAS mutations in codons 12 and 13 of exon 2, as shown in table 1. Real-time PCR was performed on a Rotor-Gene Q Real-time PCR Platform (Qiagen). The cycling conditions for quality control runs and mutation assays were as follows: 15 min at 95°C, followed by 40 cycles at 95°C for 30 s and 60°C for 1 min. Fluorescence was measured at 60°C. Data on each mutation were interpreted according to the kit manual after curve analysis and calculation of ΔCt values. RAS mutations were detected by PCR-based 2× bidirectional direct Sanger sequencing using the primers specified in table 2. The sequencing results were interpreted using Chromas software V.1.45 (Technelysium Pty, Helensvale, Australia). The human pancreatic cancer cell line Panc-1 is known to harbour a heterozygous KRAS p.G12D (c.35G>A) mutation and a homozygous TP53 p.R273H (c.818G>A) mutation, whereas BxPC-3 has no mutations at these two sites. The assay sensitivity for SNV detection was determined by sequencing serially diluted DNA isolated from the two cell lines. FFPE Panc-1 DNA was mixed with FFPE BxPC-3 DNA at ratios of 1:0, 1:1, 1:4, 1:9, 1:19, 1:49 and 1:99 (Panc-1:BxPC-3), resulting in 100%, 50%, 20%, 10%, 5%, 2% and 1% dilutions, respectively. The κ coefficient with 95% CI was used to assess agreement between the assay methods. Analyses were performed using SPSS software for windows, V.20 (SPSS Inc, Chicago, Illinois, USA). A total of 51 samples were retrospectively collected from January 2014 to March 2015. The patients included 36 men and 15 women, with a median age of 63.0 years (range: 41–87 years). Of 51 samples, 13 (25.5%) had a mutation in exon 2 of KRAS, as determined by Ion Torrent PGM NGS, with coverage ranging from 369X to 2110X and the variant frequency ranging from 22.2 to 59.1% (table 3 and figure 1A–C). The number of samples with a KRAS exon 2 mutation detected using Sanger sequencing was 13/51 (25.5%), and it was 12/51 (23.5%) using the Therascreen assay. Ion Torrent PGM analysis showed 100% concordance with Sanger sequencing for KRAS exon 2 mutation testing (κ=1.000, 95% CI 1 to 1). High agreement between Ion Torrent PGM/Sanger sequencing and Therascreen real-time PCR was also demonstrated (κ=0.947, 95% CI 0.844 to 1), and only one case of discrepant results (1/51) was found between these methods (table 3 and figure 1D–F). This discrepant case (case 37) had a specific mutation (c.37G>T) that was not covered and thus could not be detected with a Therascreen KRAS Kit. 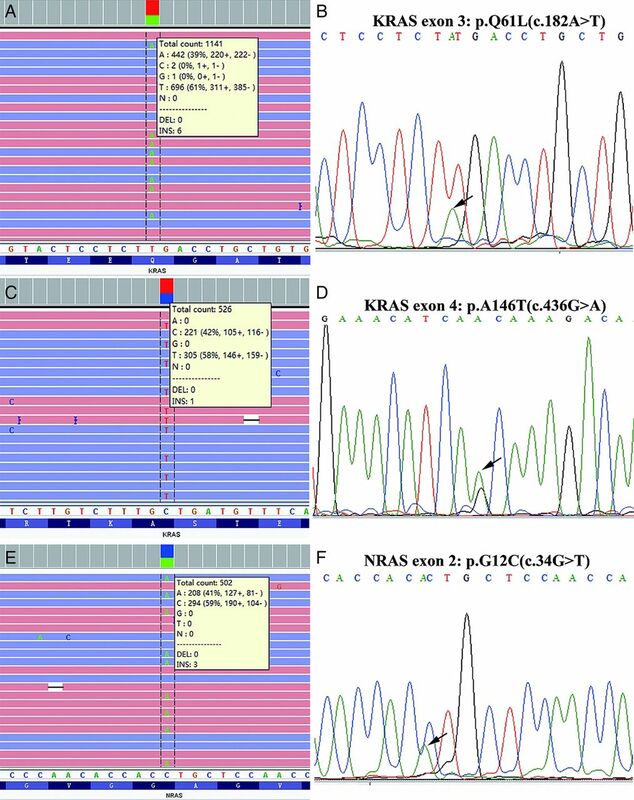 Detection of KRAS exon 2 mutations in case 24 (A–C) and case 37 (D–F) by Ion Torrent PGM, Sanger sequencing (reverse sequencing) and the Therascreen assay, respectively. To further compare the sensitivities of Ion Torrent PGM and Sanger sequencing for SNV testing, we performed a dilution series experiment using FFPE human pancreatic cancer cell lines with known mutation statuses at two sites (KRAS codon 12 and TP53 codon 273), as described in the Methods section. Our results showed that Ion Torrent PGM sequencing was able to detect the KRAS mutation (c.35G>A) at a level of as low as 1%, whereas the Sanger sequencing data were difficult to interpret when the dilutions (Panc-1: BxPC-3) fell below 10% (table 4, figures 2A–F and 3A–F). Similar results were obtained with TP53 mutation (c.818G>A) detection (data not shown). Our results confirmed the greater sensitivity of Ion Torrent PGM compared with that of Sanger sequencing. Moreover, our results showed that Ion Torrent PGM could detect the KRAS mutation (c.35G>A) at various percentages, with excellent linearity (R2=0.97) (figure 4A). There was also a strong correlation (R2=0.97) between the dilutions (expected mutation frequencies) and calculated mutation frequencies for TP53 mutation (c.818G>A) detection (figure 4B). However, when the dilutions/expected variant frequency fell below 5%, the correlation became weaker, likely due to baseline variation. Detection of KRAS mutation p.G12D (c.35G>A) in serially diluted DNA isolated from formalin-fixed paraffin-embedded (FFPE) human pancreatic cancer cell lines with known mutation statuses by Ion Torrent PGM (A–F: 50%, 20%, 10%, 5%, 2% and 1% dilutions, respectively). 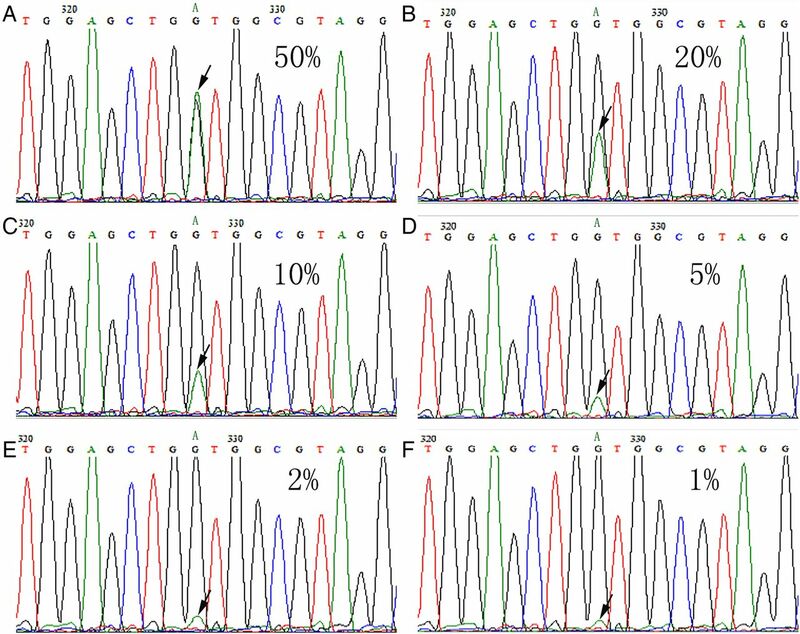 Detection of KRAS mutation p.G12D (c.35G>A) in serially diluted DNA isolated from formalin-fixed paraffin-embedded (FFPE) human pancreatic cancer cell lines with known mutation statuses by Sanger sequencing (forward sequencing) (A–F: 50%, 20%, 10%, 5%, 2% and 1% dilutions, respectively). The linearity between the dilutions and calculated mutation frequencies in the dilution series experiment performed using Ion Torrent PGM. We also explored the potential application of the Ion Torrent PGM platform for extended RAS analysis. A total of 10 cases had a RAS mutation other than a KRAS exon 2 mutation (non-exon 2 KRAS mutation, NRAS), with coverage ranging from 462X to 2420X and the variant frequency ranging from 14.3% to 66.4%, accounting for 19.6% (10/51) of all cases and 26.3% (10/38) of KRAS exon 2 wild-type cases. Among these additional RAS mutations, three cases harboured a KRAS exon 3 mutation, six harboured a KRAS exon 4 mutation and one case harboured an NRAS exon 3 mutation, respectively (table 5). All of these mutations were confirmed by Sanger sequencing (figure 5A–F). However, detection of a low-frequency mutation by Sanger sequencing is relatively difficult (figure 6A, B). 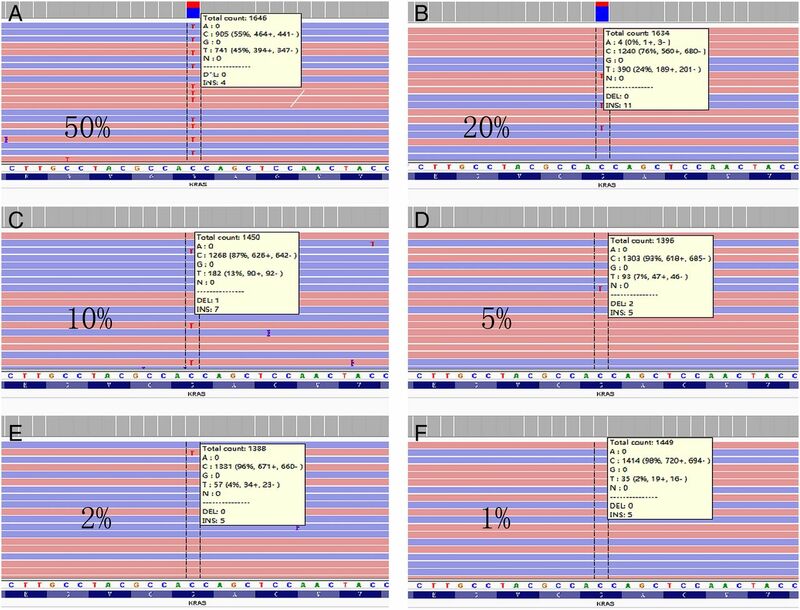 Detection of other RAS mutations in case 28 (A and B), case 50 (C and D) and case 47 (E and F), by Ion Torrent PGM and Sanger sequencing (reverse sequencing), respectively. 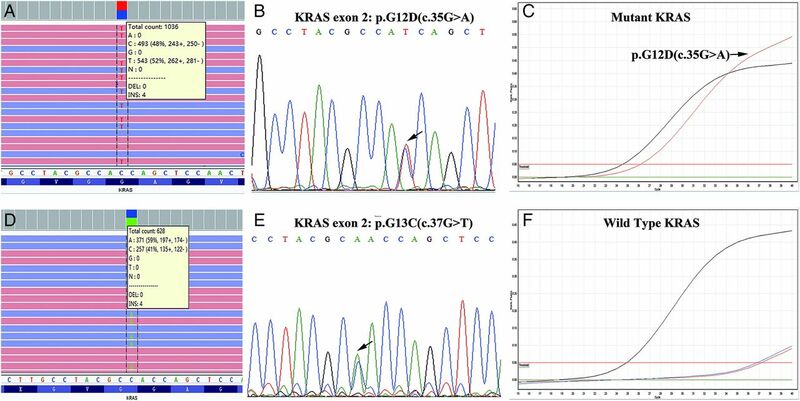 Detection of KRAS exon 4 mutation with a relatively low frequency (14.3%) in case 40 by Ion Torrent PGM and Sanger sequencing (reverse sequencing), respectively. Furthermore, mutations in other CRC-related genes (BRAF, TP53, APC, MLH1, PIK3CA, SMAD4, FBWX7, etc) were simultaneously detected by Ion Torrent PGM (see online supplementary appendix figure S1). Although KRAS exon 2 mutations predict a lack of response to anti-EGFR therapy in patients with metastatic CRC, the absence of a mutation in this gene does not guarantee treatment response to anti-EGFR monoclonal antibody (mAb). Several recent studies have revealed that other RAS mutations (in KRAS exons 3 and 4 and NRAS exons 2, 3 and 4) may also be predictive of anti-EGFR antibody therapy resistance.4 ,21 Given this, expanded testing for RAS gene mutations, including KRAS exon 2 mutations and other RAS mutations, has been recommended in the latest NCCN clinical practice guidelines for colon cancer. Ion AmpliSeq Cancer Hotspot Panel v2 was used for Ion Torrent PGM sequencing in our study, and it enabled wide coverage of the KRAS, NRAS and HRAS genes, thereby achieving expansion of KRAS exon 2 mutation testing to include RAS mutations. Consequently, a considerable proportion of patients with RAS mutations were found among our wild-type KRAS exon 2 patients (10/38, 26.3%) by Ion Torrent PGM. These patients might also be unlikely to significantly benefit from anti-EGFR mAb therapy. In previous studies, among RAS mutations beyond KRAS exon 2, mutations in KRAS exon 4 were found to occur most commonly in patients with CRC. KRAS exon 4 mutations were identified at amino acid residues K117 and A146, and the overall incidence of KRAS exon 4 mutations in patients with KRAS exon 2 wild-type tumours varied from 3.7% to 9.3%.4 Given that KRAS codon 117 mutation was not evaluated in some studies, the actual incidence of KRAS exon 4 mutations might be underestimated.4 ,22 We also found exon 4 KRAS mutations at K117 and A146 (19 A146T, 1 A146V and 3 K117N) in our 51 cases, at a relatively high frequency (11.8%, 6/51). This should be regarded with caution due to our small sample size, and warrants further exploration in larger studies. Moreover, Ion AmpliSeq Cancer Hotspot Panel v2 was designed to target ‘hot spot’ regions of 50 oncogenes and tumour suppressor genes (BRAF, TP53, APC, MLH1, PIK3CA, SMAD4, FBWX7, etc), and was thus capable of simultaneously detecting other CRC-related gene mutations and providing additional genetic information closely associated with CRC tumourigenesis, prognosis and resistance to therapy. Our results confirmed that Ion Torrent PGM was suitable for expansion of RAS mutation testing in FFPE CRC samples and that it has great potential for clinical use. Importantly, the panel we used for Ion Torrent PGM sequencing included 207 primer pairs contained within a single tube and required as little as 10 ng of FFPE DNA as a template, enabling simultaneous detection of multiple variants of a gene or multiple genes in highly limited specimens, such as biopsy and fine-needle aspirates, facilitating the cost-effective and time-effective sequencing of multiple genes and variants. In contrast, Sanger sequencing and PCR require several micrograms of DNA to detect genetic alterations within a specific region.15 Therefore, biopsy specimens may be inadequate for performing multiple genetic tests using these two methods. To make things worse, the need for multiple separate tests causes increases in time and cost. Moreover, Ion Torrent PGM data are automatically analysed and annotated with Torrent Suite Software and Ion Reporter Software, whereas Sanger sequencing data analysis and interpretation require the manual examination of sequencing chromatograms for each gene region and is thus extremely time consuming. As demonstrated in our study, identification of variants that occur at a low frequency in Sanger sequencing chromatograms is especially difficult. Therefore, Ion Torrent PGM is a sample-saving and cost-efficient and time-efficient platform for performing multiplex genetic testing in CRC. Given that few cases in our study had low-frequency mutations, larger study are warranted to further assess the clinical utility of Ion Torrent PGM in detecting low-frequency mutations. In summary, we have compared the use of three methods for the detection of KRAS mutations in 51 FFPE CRC specimens. Ion Torrent PGM was more specific and sensitive for KRAS exon 2 mutation detection than were Sanger sequencing and the Therascreen assay, and it is appropriate for use in routine clinical testing. Moreover, Ion Torrent PGM is a sample-saving and cost-efficient and time-efficient platform for multiplex genetic testing in CRC, and it shows great potential for clinical application to expand testing to include mutations in RAS and other CRC-related genes.
. Epidermal growth factor receptor inhibitors: coming of age. Cancer Control 2014;21:74–9.
. 454 next generation-sequencing outperforms allele-specific PCR, Sanger sequencing, and pyrosequencing for routine KRAS mutation analysis of formalin-fixed, paraffin-embedded samples. Onco Targets Ther 2013;6:1057–64. doi:10.2147/OTT.S42369.
. Biomarker testing for treatment of metastatic colorectal cancer: role of the pathologist in community practice. J Community Support Oncol 2014;12:27–32. JG and HW contributed equally. Contributors JG and HW performed the research, analysed the data and drafted the manuscript. HW and HZ were involved in the histological review. ZL designed the research study and was also the main editor of the manuscript. LW, HD and JL reviewed and critically revised the manuscript. All the authors read and approved the final manuscript. Funding This work was supported by the Special Foundation for Scientific Research in the Public Interest by the National Health and Family Planning Commission of China (201402001). Ethics approval This study was approved by the institutional review board of the Peking Union Medical College Hospital. Data sharing statement Additional data can be accessed via the Dryad data repository at http://datadryad.org/ with the doi:10.5061/dryad.3447g.